Among my favorites is this green 1954 Buick Skylark. I had a blue one when I was a kid. In 2012, I wrote about the rediscovery of my Miller-Ironson lumber truck, a prized possession of my childhood that I found in my mother’s attic and now proudly resides in our home. That journey back to my youth also led me reflect upon some of the other little vehicles of my youthful motorhead past. 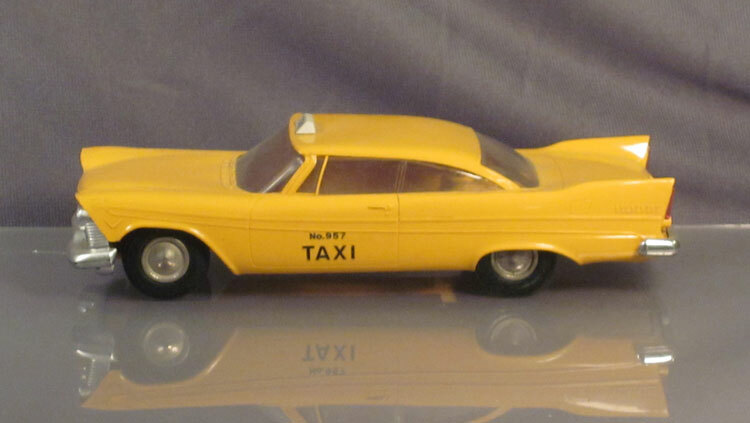 Among them were Dinky Toys, Matchbox cars, and big fix-it type cars made by Ideal. But the toy cars that I liked the best as a kid were the realistic little plastic gems usually done in 1/25 scale known today as “promo” cars. “Promo” or “Promotional” cars got their name from car dealers giving them away as an incentive to get traffic through the doors to hopefully “promote” sales for the big cars they represented. Back when I was a kid in the 1950’s and early 1960’s, we didn’t call them promo cars and we didn’t get them at dealerships. 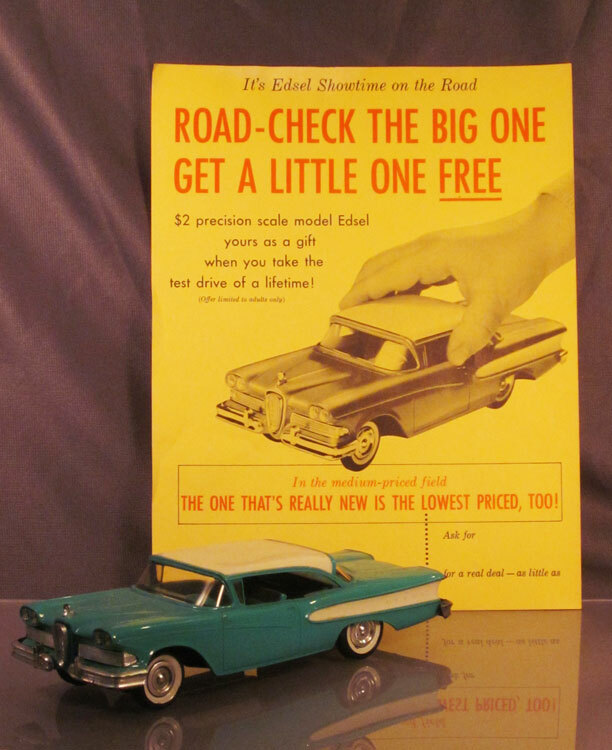 We called them scale model cars and they were available in toy stores and hobby shops for $1.50 to $2.00 each. The difference between the toy store versions and the dealer versions were that the toy store ones had friction motors to help them scoot across the floor and the dealer versions did not. Manufactured by companies such as A.M.T. , JoHann, PMC and even Hubley, these miniature cars were made with the permission of the auto makers themselves who also rendered the assistance necessary to produce these model cars in exact detail. Unfortunately, once in the hands of a child, these somewhat fragile objects that straddled being both a toy and a model often didn’t survive too long. To make matters worse, the plastic bodies on these little cars had a tendency to warp over time, especially in the late 1950’s. Non-warping bodies finally came out in 1962, but that doesn’t help anyone looking for a ’57 Chevy without a drooping back end or a ’57 Ford that isn’t just messed up all over the place. 1958 Lincoln Continental showing typical warping even though it shows little or no play wear. A close up of the warping. Nevertheless, nice, clean and hopefully minimally warped examples are very popular with collectors today. Rare examples can cost in the hundreds and, in a few cases, thousands of dollars. Most examples in good condition today, however, can usually be found in the $50 to $100 range. As always, original boxes add value and are a good indication that the car had little or no play to affect its condition. 1951 Chevys in different body styles by PMC. Chevy promos were produced in just about every body style from 1951 through 1954. My favorite era for these cars is the 1950’s, which also happens to be my favorite era of big cars as well. I am fortunate in that I still have a few of the ones I received as a kid, my favorite being my yellow and white Metropolitan made in 1960 by Hubley. I received it in June of that year as a present from my father for getting promoted from third to fourth grade. My favorite promo car is this Metropolitan which I received new in 1960. I remember going to my favorite toy store, which was Glenn Toys, located on the boardwalk in Ocean City, New Jersey. Among the Steiff animals, Tonka trucks, toy boats and all sorts of other great stuff, there was always a good assortment of scale model cars. You would enter the store and hang an immediate left and keep going to the wall. There they were, all lined up bright and new like a miniature show room. In this little car showroom, however, all the cars from a Ford Falcon to a Cadillac Fleetwood cost the same – two bucks! 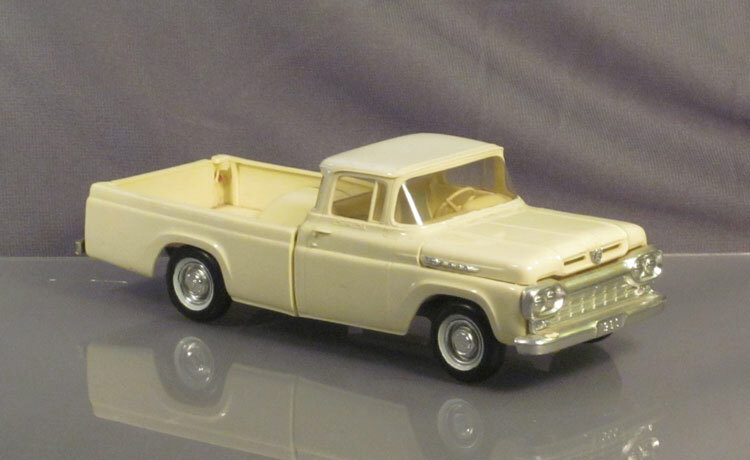 1960 Ford F-100 Pickup, another survivor from my childhood! 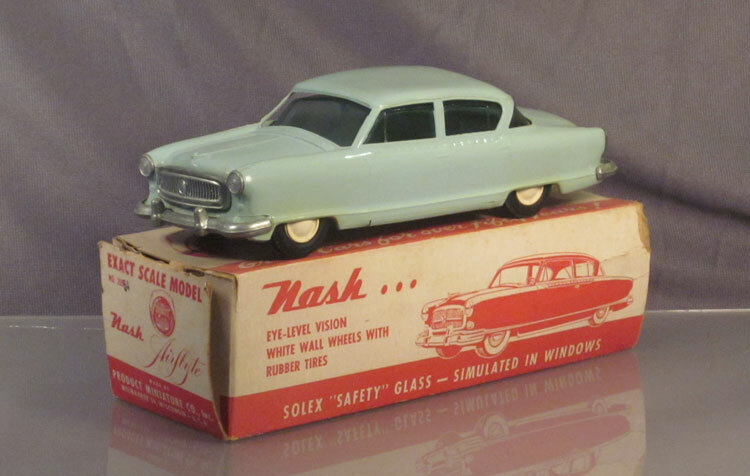 Plastic-bodied scale model cars were first produced in 1949 and are still being made today. Among the earliest examples are a 1949 Ford and Plymouth both made by AMT. A very rare 1949 Oldsmobile was produced by a company called Cruver. Before plastic, some metal promos were made by such companies as Master Caster and Banthrico, and continued into the 1950’s overlapping production of the plastic bodied models as well. 1949 Ford and Plymouth manufactured by AMT. Each has a wind-up motor. 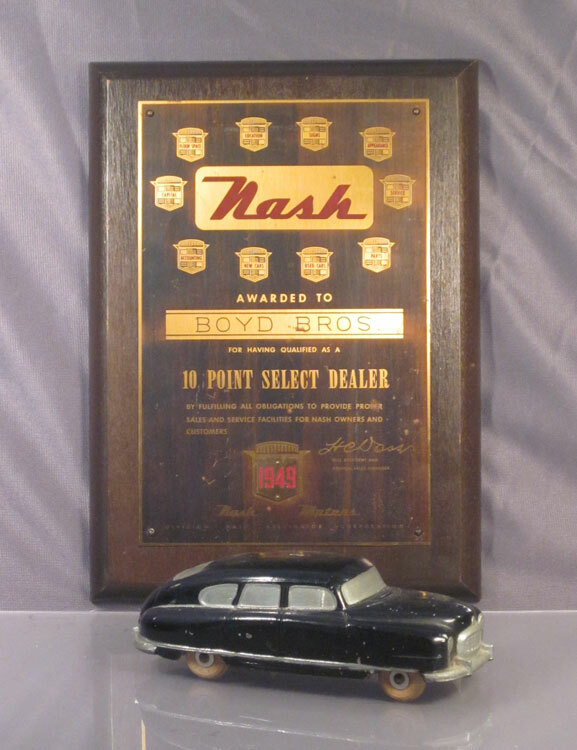 Metal bodied 1/20th scale Nash from 1949 or 1950 along with dealer award plaque. 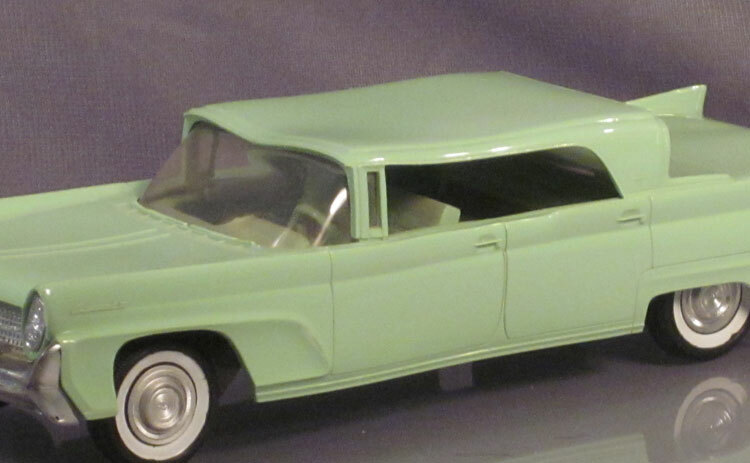 Most of the manufacturers eventually started producing model kits, AMT being the first in 1958, using the same body and interior and chrome molds as with the promos. These kits became very popular with boys of my generation and could be “customized” by adding all kinds of accessories such as fender skirts, spotlights and flame decals. Unfortunately, if a kid put them together, they usually suffered from globby paint, glue marks and sloppy construction! 1952 and 1954 Pontiac dealer promos. No friction motors! New models came out each model year and the previous year’s models were discontinued as with real cars. It’s usually pretty easy, therefore, to date a promo car. There are, however, some reissues in later years to add some confusion, but originals are usually easy to spot over their later counterparts. The reissues often have plastic screws holding the body to the chassis and the bodies do not warp. 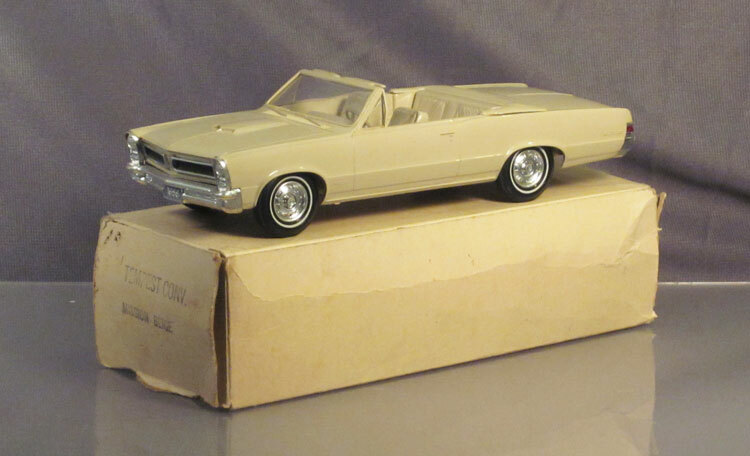 1965 Pontiac GTO dealer promo with original box. The nice thing about these little cars is that they don’t depreciate and you seldom get a lemon. You don’t even have to change the oil! 1957 Plymouth Taxi by Jo-Hann. Whoever heard of a two door taxi? 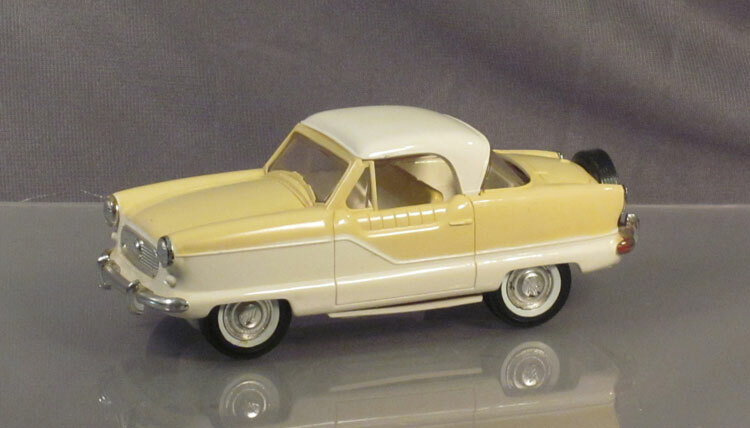 This entry was posted in 1950's, 1960's, Jim, Miniatures, Toys, Vehicular. Bookmark the permalink. Have 400 promotionals to sell.